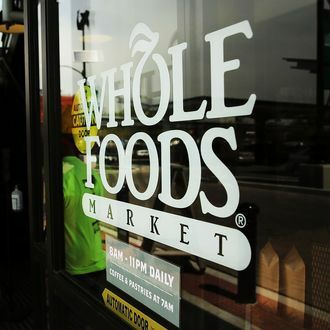 Four years after signing a deal for its 238 Bedford Avenue space, Whole Foods’ giant glass box of a Williamsburg grocery store will open at 9 a.m. on July 26. Along with the usual café and assortment of prepared foods, the bi-level, 51,000-square-foot market will be home to a location of Luke’s Lobster’s Tail Cart, where you can get skewered lobster tails to nibble on while perusing the latest in vegetable-infused waters. Fittingly, the café will be attacked with breads and sticky buns from counterculture pizzeria turned billionaire’s plaything Roberta’s, which debuted its now-expansive frozen-pizza business at the chain’s Gowanus location. The opening is the latest stage in Williamsburg’s total transformation into a hive of cool brands, with J.Crew operating a shop nearby, Apple set to open its own store down the street, and Whole Foods nemesis Trader Joe’s opening its own location a few blocks away. Hordes of shoppers are certain, and the chain’s arrival certainly won’t mitigate the surging retail rents along its corridor of Bedford Avenue, already Brooklyn’s most expensive place to set up shop.